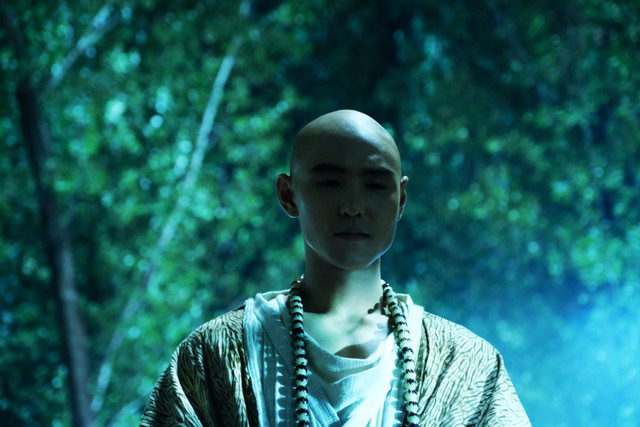 “Four Heavenly Kings” features a more mature Dee (Mark Chao), who is now the head of the Bureau of Investigations. 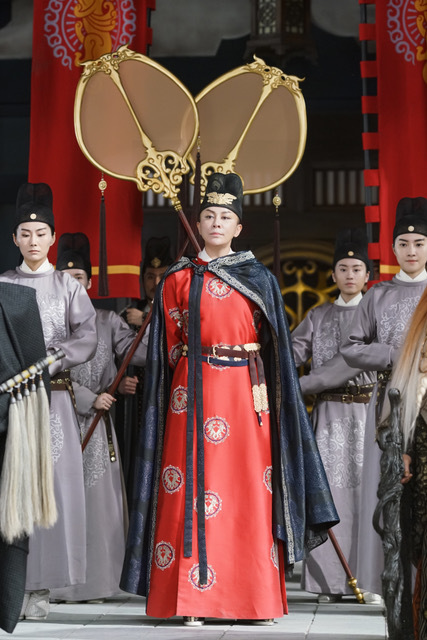 It is the reign of Tang emperor Gao Zong, who has consented to sharing his rule with his empress, Wu Zetian (who would go on to become China’s only female emperor). The emperor appoints the detective Protector of the Tang Dynasty, placing in his care a rare weapon, the Dragon-Taming Mace, forged in iron from stardust, and harder than any metal or stone. 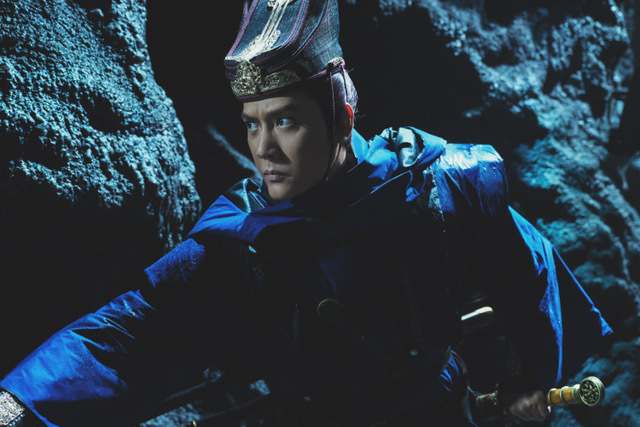 Fearing that Dee would pose a threat to her own position, the empress sends Yuchi Zhenjin (Feng Shaofeng), head of the imperial guard, to steal the mace back, with the aid of a group of hired Jiang Hu swordsman, the Mystic Clan. Meanwhile the bureau receives reports of theft from a renown painter, a case that quickly escalates to murder. As the plot thickens, intrigue and hidden motives surface, building up to calamity of a national scale. The computer-generated effects are a great improvement from “Rise of the Sea Dragon”, and impressive, considering that the fight in the temple is shot in daylight. Although practical effects were one of the ingenuities for which Tsui Hark is known, the film still bears the hallmarks of his cinematography, the saturated, stylized palette, the rapid, swooping beauty of choreography and the delicious tone of suspense and mystery. 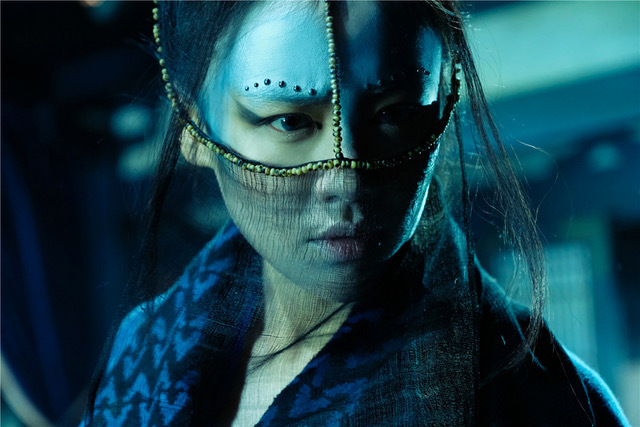 Immersed in tropes of classic Wuxia cinema, secret clans, poisoning, hidden weapons, rooftop Qing Gong, sorcery and transmutations, strong female warriors, the film nevertheless adapts these to contemporary tastes. Kenji Kawai’s soundtrack is a nice mix of traditional Chinese music and full-on Western orchestral that includes heavy foreshadowing chorals and a brief rendition of Wagner during one of Dee’s comical Sherlock-style deduction moments. The script, commonly semi-classical and idiom-laden for this genre, is delivered at a slower pace than usual, giving more time for the audience to take in the exposition. 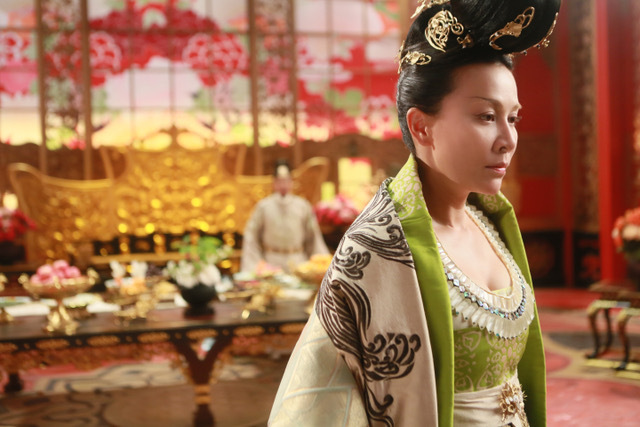 There is no harm in making a Wuxia film that is more accessible for the mainstream, that will draw new Western audiences to the genre. This mainland-Hong Kong-Taiwan collaboration certainly takes the best from all sides, not only in cast and crew, but also in film location and approach. Shot at Heng Dian Studios, the world’s largest film and TV shooting base in Zhejiang, it makes comprehensive use the realistic period interiors, streets and palatial sets. I was glad to see the proper names romanised in Pin Yin in the English subtitles, but at the same time delighted with the cheeky humour that peppers the film, which feels like a direct influence from Hong Kong cinema. Huayi Brothers’ signature steam-punk stylistics (Tai Chi Zero/Tai Chi Hero) makes an appearance here in semi-mechanical bows, lending a unique twist to this Wuxia film, as do the innovative costume designs that add an element of haut-couture and Western military chic to the mainly classical styles. Little expense seem to have been spared in this film, from the exquisite details given to the external and internal architectural backdrops, imperial conveyances and pageantry, to the precise rendition of daily life in the street scenes, accurately decked out living quarters, to the portrayal of exotic foreign merchants and performers that reflect the heyday of the Silk Road, the film is a cultural and visual feast. “Four Heavenly Kings” plays with the Dee timeline, chronologically falling after the second film which featured an adolescent Dee, and before the first one, set during the reign of Empress Wu, who succeeds her husband on the throne. The continuation of the main cast certainly helps to link the two prequels together, Chao renders a calm, mild-mannered and self-assured Dee that offsets the highly strung and manic Yuchi Zhenjin played by Feng, and Lau a majestic Empress Wu whose decisiveness and shrewdness shows even through her more impetuous younger self. 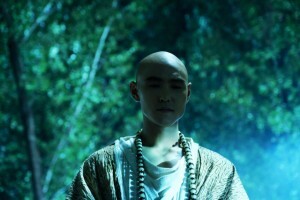 The recurring Judge Dee theme, the introduction of the golden Guan Yin statue and Dee’s mantra “hell is full of sufferers, enlightenment must wait”, serve to link this film effectively to “The Mystery of the Phantom Flame” in this time loop. There are three languages and one dialect featured in the film – apart from Mandarin, the language of the Zhanbojia Clan, the Tie Le; and the Sichuan dialect that Dee uses as a disguise when he is undercover at the palace. However, no indication of this linguistic diversity has been made whatsoever in the English subtitles, and I am concerned some of the political complexities of the story may be lost to the English audience. Beneath this tale of detection and thrills are a number of underlying themes, that of the immeasurable costs of building an empire, that of China’s ethnic diversity and the conflict of loyalties that lie within, the sense of displacement in minorities living among the majority population – reflected in the conversations between the medical officer Sha Tuo and Water Moon, both of whom are of Tie Le, rather than Han origin. The fictional Tie Le are based on a real ethnic group of the same name from north-western Asia, who were once in alliance the Tang, later conquered by the Tu Jue people. Another weakness of this film is more symptomatic of the genre. As with many popular Wuxia fantasy, this film starts with tight, deduction-based storytelling, and by the end, gives way to rollicking Wuxia fantasy fun, making up for the plot holes and lack of logic with sheer energy and spectacular visuals. Whilst this still makes a very entertainment watch, substance over style is something that certain schools of Wuxia films could improve on. As a global cultural figure, the development of Detective Dee or Judge Dee has been a fascinating one. He is based on a real-life politician who lived during the 7thcentury and held a series of posts in office, including Prime Minister at one point, and was later framed and exiled. After his death, his fearless and just reputation lived on in popular entertainment and folklore. During the 18thcentury, his most famous cases were collected in one of China’s earliest detective novels, “The Celebrated Court Cases of Judge Dee” (Di Gong An). This was later translated by Dutch sinologist Robert Van Gulik, who also wrote many modern Judge Dee novels during the 1950s. Thanks to Gulik and Granada TV’s 1969 adaptation of his work, Di Ren Jie is likely the best known (of the very few) fictional Chinese detectives in the West. His legend still inspires both Western and Chinese writers, new board games and video games from a range of international and diaspora artists. 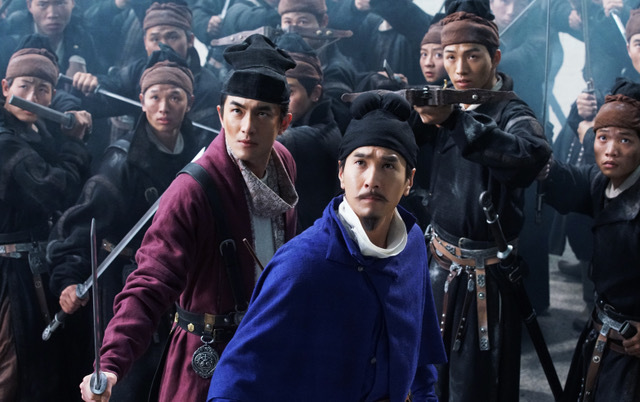 Although “Four Heavenly King” is written by Tsui Hark and Chen Guo Fu, they have retained the tone of mystery and intrigue that characterize both the Gulik novels and Wuxia fantasy. 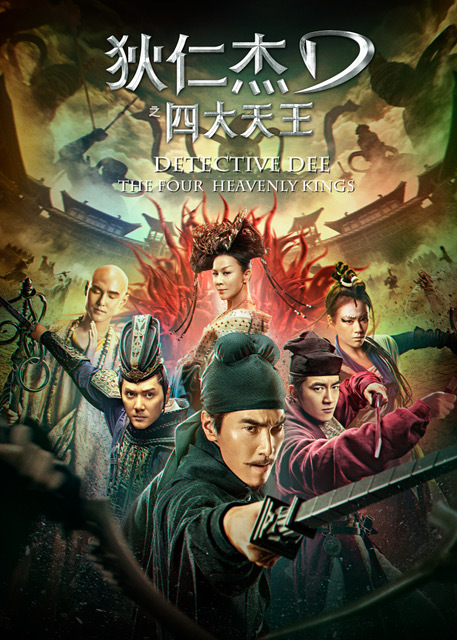 Like the best of traditional Chinese pop culture that have successfully evolved, “Detective Dee: Four Heavenly Kings”, has definitely kept a handle on the zeitgeist, not only in the Dementor-like Zhanbojia clan members, the orchestral score reminiscent of Pirates of the Caribbean, the Attack-On-Titanesque giant figures clambering over city walls, but in its focus on spirituality, pan-Asian aesthetics, and the life of San Zang (a.k.a. Tripitaka), all of which have had substantial revivals in contemporary China (this is one of the first work in Chinese to feature a kickass San Zang). The conception of his disciple as a giant ape may have more to do with the influence of Steven Chow than King Kong. I hope the legend of Di Ren Jie lives on in the 21st century, spawns and diversifies into multiple branches.